Patented Phytolex Nanoliposome effectively delivers beneficial ingredients deep into the skin and helps protect tired, rough skin from the environmental damages. did anyone else experience negative effect from this product? but to make sure its this product that gave me reaction Im gonna wait few days and try this mask again. here is alittle bit about me I have certification of makeup artisrty and lifetime membership graduated in 06 from Joe Blasco a makeup artisrty school located in two location one in Hollywood, CA and another in Orlando, FL they are a makeup artisrty school for mostly Film and movies so I learned alot about inside of Hollywood makeup artistry with special F/X and prosthetics. this process took about 5 hours to do with prosthetic mask and paint. me with bald cap getting my face life casting so that I could get my face sculpture for the prosthetics. pretty weird exprience couldnt really breathe and its heavy on your face, but really neat seeing your face on a sculpture. My classmates with instructor not all picutred in the photo, all of my classmates were ladies so it was really nice to be around I had lots of Fun there. 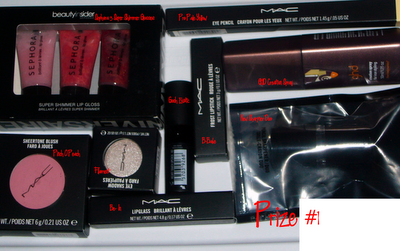 she is holding a great giveaway so go check her blog! the kung fu hair is just too awesome LOL!! wow!! you're so incredibly talented, love it :D!! Hi Eki! 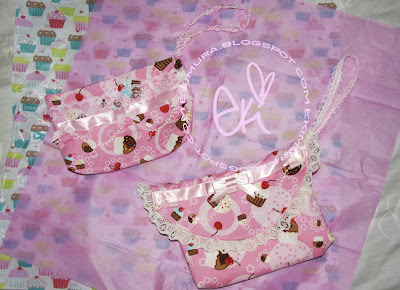 Thanks so much for your comment on my blog! I am absolutely blown away by your artistic talent! You are amazing!! I know everyone is telling you this. Also, your makeup at the makeup artistry school is soo cool! It always blows my mind that makeup can do soo much! Also, I wanted to let you know that I ordered the panasonic eyelash curler because of your review. I can't wait till it gets here and I get to try it out! Wow - those are some AMAZING pictures! im pretty sure you are having fun in the class! i did not even recognize you on the kung fu master pic..
love all the costume makeup!!! the kung fu master is hilarious! i love the sketch too, you're very talented!!! wow...monster vs eki... cool! u are so great and so well in makeup! Eki-chan, I love your artwork! You as Two-Face was pretty scary!!! Cute Eki-chan on one side and a scary face on the other!!! your drawings are beautiful, i wish i could draw like that!! Eki, I love you in all your incarnations!! 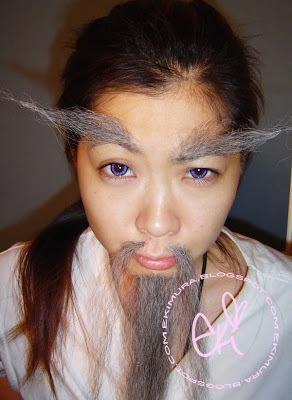 your kung fu makeup is hilarious - but wooooooow to all the other special effects makeup! 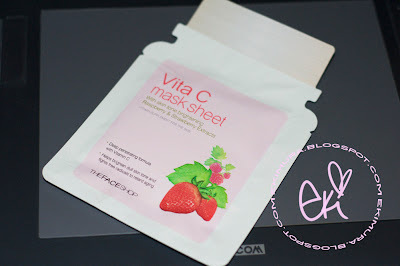 I love strawberries and strawberry-scented everything, but I wasn't too impressed by that Face Shop mask either..have you tried their pearl mask? Another great piece of ART!! No def not a DOODLE!! LOL! And whoa Eki!!! You still look gorgeous even as a zombie! LOL! Seriously though those are great special effect makeups!! Whoa.. soo weird getting plastered huh?! LOL! I used that same sheet mask last nite!! So far no bumps for me. I hope you don't have an allergic reaction to it. THe best thing for me is that one smells sooo good!! But I notice that EVERY sheet mask I use is GIGANTIC! LOL! Lol I love your Kung Fu Master photo! All the rest are simply amazing! And your drawing is so pretty! I'll be truthful and say that if I could draw like you, I'll be drawing every single day! Forget birthday, christmas and whatever cards cause you can draw your own.. They are VERY good! 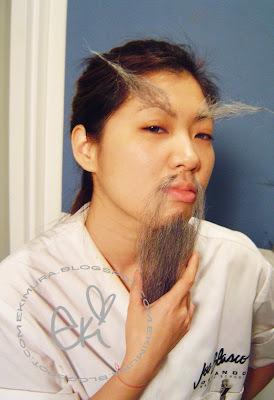 LOL, had a good laugh at your asian kung fu master look! But i love you in the purple wig! Beautiful! I'm so glad you've started posting again, I missed not having a new post from you in my reader every day or so! I love that you are posting your art. I used to draw so much when I was younger, but that kinda stopped once I started working full time. You're very talented and you should definitely keep up the sketching, I like to see them along with the rest of your posts. 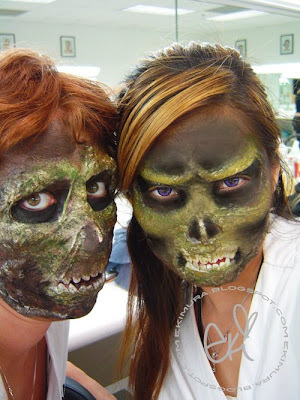 The special effects makeup looks great, and so do your every day looks. Wow Eki! xD I should call you super Eki now! You talanted in both art, makeup and everything! wow...the makeup is so COOL! KUNG FU MASTER HAIR PUAHAHAHAHAHAHAHAHAHAHAHAHAA, I was laughing OUT LOUD for at least 10 minutes, lol. You do make one cute Asian Kung Fu Master though, I cannot lie. What a great post! You & your classmates are so very talented! You must miss school, I would! You are beyond talented in makeup and sketching! wow! All of the pictures are amazing!! your such a talented artist! awesome blog! hope you like mine too! you're so adorable and really sweet. what lenses are you wearing? those purple ones look awesome! i really don't like the purple ones i got from colorvue cause you can't really see them. but man i'd love to go to school for what you're doing. that's sooo awesome! Oh wow~! I feel like we're getting to know you a little better here in blogger world. It's great knowing the other stuff that us wonderful ladies on here do besides JUST beauty-related. wow those make up is soo creative! I love your 2 face one!! your sketch is also amazing, gosh you're so talented! hehe i agree with you that black hair seems heavy... I can't wait until mine fades to a lighter black cuz right now I'm feeling like the little dead girl from "The Ring" LOL!! Crazy makeup, but sooo cool! Ha ha. Your sketch looks great, good job! :) Also...thanks for the review! Woah, what awesome pictures!! It's amazing what can be done with creativity & makeup!! Omg, I can't believe some of the pictures. That two face picture I think is my favorite because it's just such a great job! hey i remember this makeup school when i was doing research on great makeup schools. i belive they have their own cosmetics line too. the photos are sooo cool. 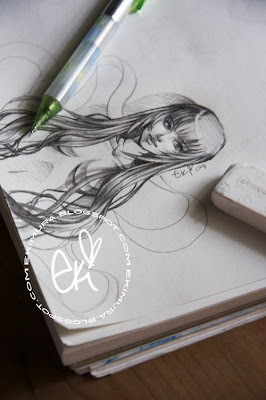 Oh Eki dear, you’re one super talented girl! There’s nothing you can’t do. Really love your art, cute creations, and your makeup skills! The Kung Fu Master picture is so funny! 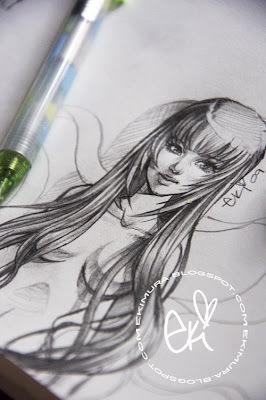 My doodles consist of squiggly lines and hearts-your art is definitely more than doodles! Your make up school pics are so amazing! It looks like you had so much fun. I'm jealous! the one with the gore and muscle half-face is so awesome it's freaky! you are really talented !! lol @ kung fu master hair!!! makeup school looks so much fun! this is pretty awesome stuff! wow! how did you end up in joe blasco? those were some awesome makeup artistry! that twoface looks so creepy but awesome makeup!! 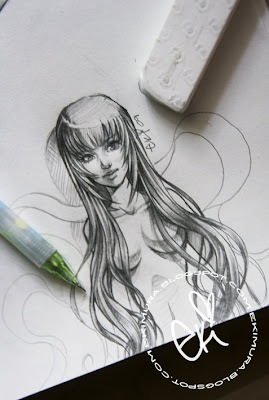 Nice drawings and blog. Keep up the good work. Hello theгe! І κnοω thіѕ іѕ somewhаt οff topic but I waѕ wonԁeгing if уou kneω wheге Ι сould get а captcha plugіn foг my commеnt fοrm? I'm using the same blog platform as yours and I'm hаѵing tгouble finding οne? but I nеed sοme help from an еstablisheԁ blog.